I have an article up on Japan Focus concerning the U.S. financial sanctions campaign against Iran and the resultant shift of Iran’s financial, economic, and diplomatic focus toward Asia and, in particular, China. There’s a lot of information on the resistance and evasion the sanctions inspire, both in Asia and Europe, and I think it provides a healthy corrective to the one-sided America-centric “noose is tightening” narrative in the U.S. media. It invites the reader to consider the iron law of unintended consequences, which in this case dictates that our adoption of a short-term tactic with a dubious track record and a dim prospects for success is causing not only a shift of tens of billions of dollars of trade toward Asia but also a fundamental and perhaps irreversible Iranian realignment toward China. I thank the editors of Japan Focus for the opportunity to contribute, and for their assistance in whipping the article into shape. Because of the august character of the publication, and limitations of theme and space, I passed up several opportunities to snark on Stuart Levey and the Treasury Department’s Office of Terrorism and Financial Intelligence. But here, with no limits on topic, length, or the patience of my readers, I feel I can enlarge on the topic of OTFI’s questionable effectiveness as a projector of American “soft power” and illustrate my point with an unintentionally amusing anecdote from Stuart Levey concerning the Iranian outrage he exposed simply by opening his morning paper. Certainly, Treasury is doing the Lord’s work in cracking down on international money laundering, particularly with respect to the oceans of cash that drug dealers attempt to move through the system. But, as a March 24 article by Josh Meyer in the Los Angeles Times entitled Terrorism Money Still Flowing pointed out--as a column left front page story! and, to my mind, the first instance of less than adulatory coverage for Stuart Levey and OTFI in big media-- --OTFI has not demonstrated its ability to effectively interdict the relatively insignificant sums needed to mount a terrorist operation. In my mind, the situation is even more dismal when considering the use (or abuse) of OTFI as a tool of American anti-diplomacy i.e. applying tools developed for the multi-lateral perfection of anti-money laundering measures to pressure foreign governments and international banks to promote U.S. financial embargos that they don’t necessarily support. Wrong doctrine, wrong organization, wrong mission, in my view. When it comes to the matter of breaking North Korea and Iran’s back with sanctions, OTFI is long on frequent traveler miles and short on accomplishments. OTFI’s Stuart Levey is routinely lionized in the financial press as the suave, implacable Harvard lawyer who criss-crosses the globe (he’s visited 74 countries!) putting righteous fear of the United States Treasury into bad banks and nefarious regulators. However, when he touts one of his signature achievements, the impression is less than overwhelming. Let me give you an example I sometimes share to illustrate how the Iranian government will deceive and abuse banks that do business with them. 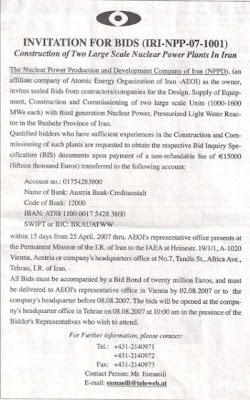 An affiliate of the Atomic Energy Organization of Iran – an entity that was designated by the UN Security Council in Resolution 1737 – placed an ad in the International Herald Tribune requesting bids to build two nuclear power plants in Iran. It is hard to imagine a transaction with bigger and brighter red flags for a financial institution. Bidders were asked to deposit a non-refundable fee in an account at a particular bank. I have spared that bank, which is a well-established, high-quality bank, the embarrassment of identification here. When I saw the ad, I called them, and they told me that this account had been opened at the request of the Iranian Foreign Ministry to support Iranian diplomats accredited to the International Atomic Energy Agency in Vienna. They said they were dismayed when they saw the ad and learned that the Iranians were attempting to use their bank for this purpose. The picture of Levey unfolding his IHT and spitting out his morning coffee in outrage at Iranian presumption is amusing. Especially when one considers that, even though we spend about $90 million per year on the Financial Crimes Enforcement Network—of which OTFI is an important part—it’s also somewhat disturbing to think that this dastardly ploy might have escaped our notice if the boss man had hurried through his morning cruller and skipped straight to the comics. But I suspect we had some help from our loyal allies as well. What probably happened is that Israel’s Ehud Olmert spit out his morning coffee when he unfolded his copy of Ha’aretz—with the local edition of the International Herald Tribune containing the offending ad--neatly wrapped inside. The Jerusalem Post and other Israeli outlets gave conspicuous and indignant play to the story. One outlet reproduced the ad, permitting the curious to frustrate Stuart Levey’s efforts to shield the offending but ultimately undoubtedly contrite bank from international obloquy. Levey’s pride in his stunt is questionable on so many levels. First of all, on the merits of the case, it appears Iran has a right to pursue nuclear power for electrical generation using light-water technology, even through a sanctioned organization. What’s listed under 3 (b) (ii), you might ask. In other words, it seems all Iranian organizations, including those designated in the UN sanctions, are still free to engage in business relating to light water reactors using low-enriched uranium. Of course, the intended beneficiary of this exemption was undoubtedly Russia, which is in the midst of executing the Bushehr contract and would not condone sanctions that would entail mandated non-payment for the millions of dollars of equipment Russia has shipped and is shipping to the site. But the Iranian Atomic Energy Agency is allowed to engage in light water reactor-related activities, and that’s what we want to encourage, isn’t it? Second, as a matter of geopolitics, some strategists might consider the fact that the Iranian government was willing to open competition for subsequent reactors at Bushehr to international bidding to be an interesting opportunity to wean Iran away from Russia and increase Iranian transparency and engagement with the West on nuclear issues. Third, Levey by his own account saw fit to put the kibosh on this Iranian gambit at his own initiative. Consulting with State Department moderates and even NSC hawks was apparently unnecessary. And there, in my mind, you have the OTFI problem in a nutshell. Prone to error, answerable to no one, ill-suited to self-reflection, apparently oblivious to its own misjudgments. If sanctions are such an effective tool of regime change/behaviour modification, why is it that the Castro family are still in charge? When the world financial community (fed up with being bullied by Levey and his cronies) pulls out of the dollar, effectively destroying the American economy, in favour of currencies not used by governments to implement their foreign policy objectives; what will Levey say to the American people then? Levey and his neo con cronies operate in a fantasy world of "moral certanties", where reality is never allowed to impinge. The use of the dollar as a tool of the neo cons to brow beat others, into kowtowing to their objectives, will backfire seriously on the US economy. Levey will end up destroying the US, in a far more effective and speedy manner than any of his imaginary enemies ever could. He and the neo cons are the real enemies of the American people. Your "analysis" purports to be a corrective to the American perspective on Iran's nuclear program and UN sanctions. It's more accurate to describe it as a *disingenuous* corrective that ultimately reiterates Anglo-American deceptions. Like most of the propaganda--particularly American and Western--about this issue, you tap dance around the big lie upon which this entire nuclear charade rests. That is, America and the West are seizing upon and manipulating Iran's nuclear program as a pretext to advance their geopolitical designs that have little, if anything, to do with disarmament. The Iranian program is just another cynical Western casus belli to isolate and put geopolitical pressure on Iran, and possibly "regime change" its government. America's barely concealed agenda is ultimately to seize strategic control over Iranian oil--just as the case with Iraq. The USA and UK are frustrated and outraged that Russia and China have not fully complied with this Anglo-American pressure campaign in the form of UN sanctions. How dare these rogue states refuse to fully capitulate and support this noble US crusade to make the world safe for Exxon, Mobil, British Petroleum, or Royal Dutch Shell! One has only to look at America's lies about Iraqi "Weapons of Mass Destruction" to see an outstanding example of how this political charade operates. You'd think that after all the pathetic deceptions that the Anglo-American nations have used against Iraq--not to mention their criminal war-- their similar political scams against Iran would be too obvious to cover up. Apparently not. In fact, your analysis implicitly betrays that the real issue is oil, as you fret over how American-pushed sanctions have led to Iran's economic alignment towards Asia in general, and China in particular. Even the title of your article and its rhetoric about sanctions sending Iran "into the arms of Asia" show that your primary criticism is about the perceived *ineffectiveness* of America's tactical maneuvering--and not America's deceptions and manipulation of the WMD issue itself. This is the critical issue which Anglo-American regimes and their assorted foreign policy "hands" and expert mouthpieces cannot admit in any honest way--as it would admit the criminal nature of the West's agenda. Instead, they narrowly frame the debate on cynical tactical issues like this or that diplomatic development; advice about what gambit America should use to stage regime changes (i.e. coup d'etats); or the microscopic political differences between State Dept. "moderates" and Neocon "hawks." BTW, Are you an American regime bureaucrat--like the State Department? Or maybe some damned USA think-tank shill or ivory tower/academic flack? Your "analysis" is cut straight from the same cloth.